Learn how to export an HTML or PDF version of a Manual. This will contain a table of contents that links to all of the lessons in your manual. NOTE: This feature is only available in the Pro version of ScreenSteps. Select the manual you would like to export. Select Word, PDF, HTML or Package from the export menu. Note: You can also export manuals to ScreenSteps Live but the process is slightly different and will be covered in a different lesson. Select the template you would like to use (1). You can choose to make the selected template the default template for manual exports (2). 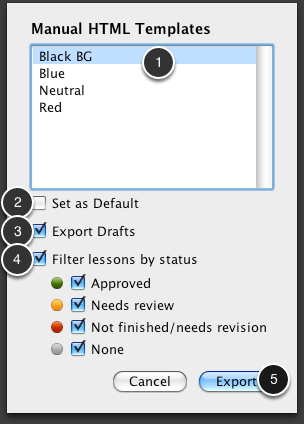 Checking Export Drafts (3) will include draft content in your exported manual. If you just want to include lessons with a particular status you can check/uncheck status boxes as needed (4). Once you are done select Export (5). 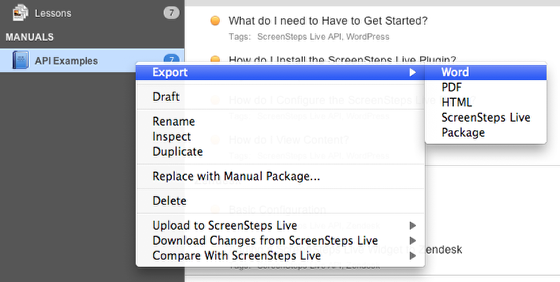 NOTE: You can edit your templates in the ScreenSteps Preferences. You can also select the Topic and then choose File > Export Manual. Word - A manual with a table of contents will be exported in DOCX format (compatible with Word and various other word processors). PDF - A PDF manual with a table of contents will be created for you. HTML - Various HTML files and folders will be created. You will be asked where you want to save the files (you should probably create a folder to store all of the files that will be exported). 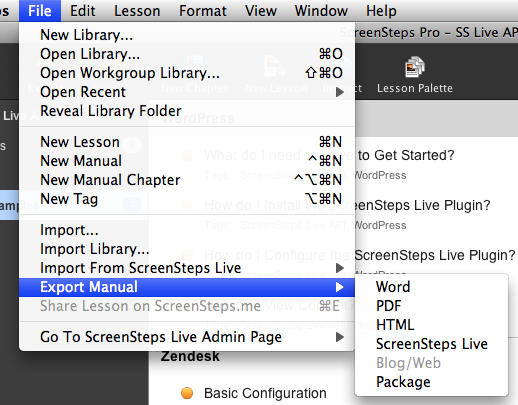 ScreenSteps Live - Your manual will be published to ScreenSteps Live. You must have a ScreenSteps Live account to use this option. Package - A single package file will be created. This is used to move the manual between ScreenSteps Libraries. For example, you would use this if you needed to send a manual that you were working on to another ScreenSteps user. That user could then edit the lessons in the manual. Right click on a topic and select Export. You have the same options as mentioned above. Prev: How do I reorder Chapters? I would like to change the title of the "Table of Contents" when exporting a manual to PDF. I have german customers and so I'd like to translate it. Is this possible? @thomas Not in the current version. This is something we are looking at for an update to PDF we are working on. Is there a way of restricting the use of the PDF prior to exporting (as in Acrobat)? @JS - no, ScreenSteps does not support any security features in PDF output. 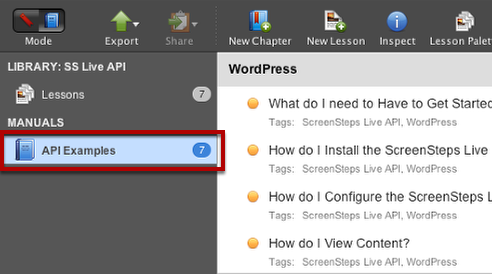 is it possible that the step titles are listed in the table of contents as well? 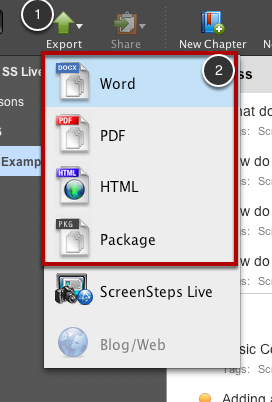 @Alain It is not possible to add the step titles to PDF or HTML in ScreenSteps 2. You can probably adjust what gets included in a Word document table of contents when you generate the table of contents within Word.